Antiaris welwitschii Engl. ; Antiaris macrophylla R. Br. ; Antiaris africana Engl. ; Ambora toxicaria Pers. The tree reaches a height of 40 to 50 m, with a straight, cylindrical bole clear to 23 m in length. Trunk diameter attains from 70 up to 170 cm and is sometimes buttressed. Antiaris toxicaria is found in primary forests and grass savanna forests. Distributed throughout the primary forest zone of West, Central and East Africa on widely varying sites. Wood diffuse porous. Occasionally vessels exclusively solitary (over 90%). Tangential diameter of vessel lumina 150 to 200 micras (medium). Tyloses thin walled. Non-vestured pits. Vessels per mm2 less than 6 (rare). Simple perforation plates. Vessel-ray pits sim Axial parenchyma lozenge-aliform. Occasionally prismatic crystals in non-chambered axial parenchyma cells. 5 to 8 cells per parenchyma strand. 4 to 10 rays per mm (medium). Rays non-storied. Larger rays more than 4 seriate. Body ray cells procumbent with mostly 2 to 4 rows of upright and/or square marginal cells (Kribs-II). Septate fibers present. Fibers with simple to minutely bordered pits. 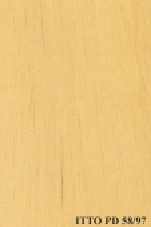 The heartwood is white to light yellowish white, it is not demarcated. The silver figure is barely visible. 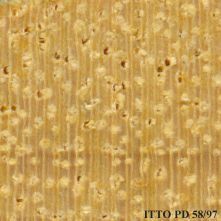 The texture is typically medium to coarse. The wood luster is reported to be rather low. Ease of Drying: Air seasoning is rapid. Boards 25 mm thick take about 3 months to air dry. Drying Defects: Risk of cupping, shakes tend to open and knots split slightly. Kiln Schedules: Schedule recommended for Black Wattle. The timber kiln dries rapidly but marked collapse may occur in early stages of seasoning. This can be remedied by reconditioning.